I see that Force India is continuing with the arbitration regarding customer cars in the shape of the Toro Rosso and Super Aguri teams. This action was begun at the beginning of last year and one wonders whether it will ever see a conclusion, so long has it been running. Although separate from Williams' threatened legal action should Prodrive enter F1 with a McLaren chassis, the arbitration issue was, no doubt, an added factor in persuading Dave Richards to give up on his attempt to compete in the sport this year. With a Force India spokesperson maintaining that the team would be happy to see STR and SA forced to withdraw from F1 ("the lesser [sic] competition, the better"), it becomes clear that this issue has the potential to drastically limit the number of teams on the grid for 2008. To my mind, it is time this matter was brought to a close, one way or the other. Although I wish Force India all the best in their efforts in the sport, the endless arbitration drama has gone on too long already and does nothing but harm to F1 in general. It is presumably too late for anything to be done about STR and SA participating in the 2007 season and it seems farcical that still no decision has been reached after an entire year has gone by. I know that everything has been complicated by the failure of the teams and the FIA to sign a new Concorde Agreement, but that is no excuse for allowing things to drag on for so long. If the existing structures cannot cope with the matter, it surely is time that the FIA stepped in and brought the whole business to an end. Max seems to think that the lack of a Concorde Agreement gives him a free hand anyway; let him use that to decide things once and for all. The teams argue that, with no new agreement in place, the old one continues, but this is dubious in the extreme. A time limit is a time limit, after all, and I agree with Max on this one (a rare event indeed). As long as this continues, any prospective entrants to F1 will be turned off the idea. That may suit Force India in that it allows them to finish higher up the race order but it is not good for the health of F1. Ninth in the constructors' championship may sound better than eleventh but it is still last place if only nine teams compete. In fact, Force India's decision to carry on the arbitration process rather gives the lie to their ambitious statements at the launch of their 2008 car. If they are hoping for midfield places later in the year and podiums in the years to come, they are going to have to compete with much stronger teams than SA and STR. Getting rid of their weakest rivals may even be delaying the team's vacating of the last places on the grid; they will find it much harder to get on terms with the likes of Honda, Toyota and Williams. I do not know why the arbitration has been such a long drawn-out affair and, quite frankly, I do not care. The point is that it needs to come to an end without further delay. It benefits no-one apart from a bunch of lawyers and, in the meantime, F1 is left in a state of limbo, not knowing whether the so-called 'B' teams will be allowed to compete or not. The sports' structures have failed to bring about a quick and decisive result; it is time that Force India acted in the best interests of the sport and called the whole thing off. It may have suited Spyker to start the process last year but Force India should not be saddled with such a sour and divisive legacy. Vijay Mallya should realize that arbitration can achieve nothing for his team and he should end the matter now, before the new season begins. Your last line Clive, really says it all: "Vijay Mallya should realize that arbitration can achieve nothing for his team." in F1 watch a parade, a small, short parade. We've even got pundits that want to ban re-fueling! Talk about worlds apart. espionage and law suits, we the fans drive out good drivers just because we tire of them, but still we come back. Hmmmmmm? It is absolutely ludicrous that no decision has been made. This is a fundamental issue and there should be a limit in the procedures by which date a decision must be made. Imagine if by some miracle Super Aguri make a minor modification to last year's Honda which sorts out its problems and Sato wins the championship. Is Max then going to make a decision that changes the result of the championship? Given he pronouncements at the end of last season I doubt it. My understanding is that the Concorde Agreement stays in force until the end of 2012. I posted something on this subject on GP Wizard. I will try and find it. I am sure Alianora can recite whatever rule applies anyway. I think it's the teams that consider the Concorde Agreement to run to 2012, Steven - Max certainly doesn't. Strangely, there have been no challenges either way as yet and we will probably have to wait until an issue comes up that depends on the agreement for its settlement. Then we'll find out who is right. I found the appropriate thread. It refers to a grandprix.com piece which stated that the FIA, FOM and Ferrari had decided that in the event of the Concorde Agreement not being renewed the existing agreement would stay in force until 2012. Given the lack of comment presumably the other teams agree with the idea that the FIA, FOM and Ferrari run F1. First time I have seen that structure formalised. "Toyota was WELCOMED into NASCAR last year..."
number 38, you're stretching the truth a bit there. many were wary of such a move - fans, drivers and other teams included. as it happens they earned a decent amount of respect throughout the year, but not from the offset. The customer car case is being decided by the Swiss Court of Arbitration in Lausanne. It is not controlled in any way, shape or form by the FIA or any of the teams involved in this case. Short of withdrawing, none of the parties have any power over the speed of the proceedings. Colin Kolles knew this when he started the proceedings, but it is the only way a provision of the Concorde Agreement can be challenged, according to the regulations. In any case, parts of the 1998 Agreement still apply because they are embedded in the current Technical Regulations. Although customer cars are not included in that, the arbitration process is still valid because it started when the Concorde Agreement was still in force (2007) and in any case the Technical Regulations are written in a way that still forbids their use (even though Max Mosely hasn't figured this one out yet...) However, the Court of Arbitration still has the power to supersede the FIA if (as in this case) it is asked to intervene on specific points of the regulations. Anyway, when Spyker initially started the arbitration proceedings, the FIA and Bernie lost control of the issue, and legally cannot get it back until the case is decided or ended. If the arbitration case rules that the customer teams should not have been in the 2007 championship, then some sort of recompense will have to be arranged, probably monetary. 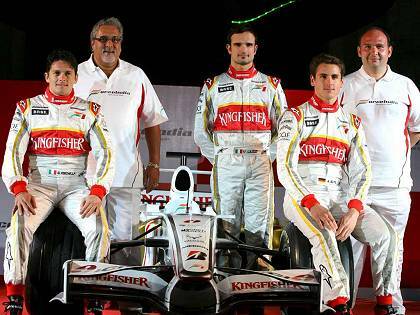 This would help Force India because it still doesn't have a Ferrari-esque budget, even with Mallya's large contribution. There's also the future principle. If customer teams are allowed, then inevitably teams will compete to have the most customers for their chassis. This will result in the number of constructors gradually reducing as constructors fall out of the arms race. Remember that sameness of car reduces overtaking and team performance mobility when everything else is equal. Eventually, the most likely occurrence is that Ferrari and its fastest competitor of the time will be left supplying the field - in a very samey competition with little competition, and no room whatsoever for a small constructor like Force India. So Force India is fighting for the long-term future of F1, at the expense of some short-term discomfort and blocking the likes of Prodrive from getting in. The trouble is that without a long-term for the concept underlying Force India, there really isn't any point in it being there. For that matter, the likely consequence of permitting customer cars in this age would lead to F1 being seriously unsustainable, so FI's time to make an impact would be shortened. So logically it must continue to fight this battle, regardless of the cost - and unfortunately the cost is pretty high. Thank you ... even though such logical reasoning endangers my ‘last of the male chauvinist pigs’ status. I don’t suppose you’d have any interest in replacing Mad Max after he eventually retires, or alternatively is finally committed to care? Alianora is truly wonderful and I support your nomination of her for FIA president completely, David. Thank you again, Ali, for yet another clear and concise explanation of the convolutions of FIA and Concorde regulations and procedures. Without you we would forever be mired in our misconceptions and assumptions!